Brighten your nursery with a beautiful classic. Both beautiful and classic the Storkcraft Alpine 4-in-1 Convertible Crib is a must-have for any nursery. This convertible crib is designed for multiple stage of life by easily adjusting into a toddler bed, daybed and finally a full sized bed (crib conversion rails sold separately). With a three position height adjustment the crib allows you to change the mattress height as your child grows. Mattress, daybed rail/toddler guard rail kit and crib conversion rails sold separately. Our team designs products with real family safety in mind, like they’re designing for their own children. 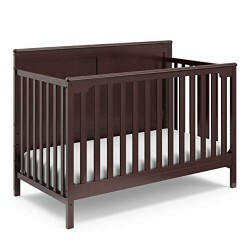 Like all our cribs,Storkcraft Alpine 4-in-1 Convertible Crib is certified by the Juvenile Products Manufacturers Association (JPMA) and is meticulously tested to meet or exceed all applicable Consumer Products Safety Commission (CPSC) and American Society for Testing and Materials (ASTM) safety standards to ensure the safest sleeping environment for your child. It’s important we focus on all the details, so you can focus on the family moments. ADJUSTABLE MATTRESS HEIGHT: With 3 adjustable mattress heights, the Storkcraft Alpine 7-in-1 Convertible Crib not only provides safety, convenience and comfort, but also is made to grow with your baby throughout all of life’s stages. COMPLETE NURSERY COLLECTION: Storkcraft manufactures a wide range of quality products for your total infant, toddler, child, or teen bedroom solution, including changing tables, dressers, gliders, mattresses, beds, and bunk beds from other trusted brands like Graco, Thomasville Kids, and Broyhill Kids. TRUSTED QUALITY: For over 70 years, Storkcraft has been manufacturing quality furniture for infants, toddlers, kids, and teens. Compare our line of innovative products to those from Delta Children, Dream on Me, DaVinci, Babyletto, or Fisher Price.